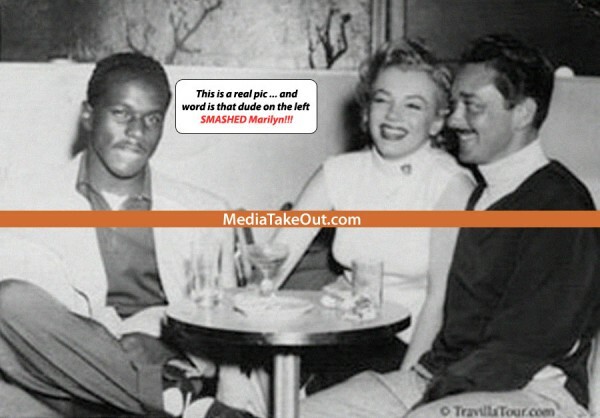 This is one of those Hollywood Urban Legends that although seldom discussed, has become extremely relevant in regards to what’s going on in modern American society and specifically with Hollywood Popular Culture, but for this article we can simply state that while it may have been that the racial climate of American society during the 1950’s is what led to the unidentified black man in the controversial image being and remaining unidentified to this very day, another logical reason may simply be due to the fact that he just did not crave attention and was perfectly fine with Marilyn having all of the spotlight as the star and primary attention seeker/finder, while he provided leadership from behind, making him hold extremely high value for Marilyn Monroe as the type of immortal soul that she was/is? Win a #MarilynMonroe inspired trip for 2 to NYC & a spa package at @marilynmonroespas from @aeropostale! Visit an Aéropostale store in the US and enter the Shine On, Scratch Off promo for your chance to win.